Did you get to see Pam Oldroyd's fascinating presentation in the Hadleigh Library last month? If not then you missed a treat with just on 50 copies of old photographs on display and a file on every house in Aldham, complete with its own photographs, available for inspection giving as much information as had been gleaned about the buildings and the people who lived in them. These cross-threads in the life of Hadleigh and Aldham were sidelights contained in a wide range of material used to illustrate the changes in the village from Domesday to the present time. The section entitled Early Snippets included lists of Aldham residents paying Ship Money and Hearth Tax 17th century inventories and an 18th century apprenticeship indenture. The section People and Places contained write-ups of individuals from the past, from leading members of the community to the un fortunate man sentenced to 7 years transportation for stealing peas to feed his hungry family. Diagrams in the Then and Now section compared the Aldham landscape as revealed in the Tithe Map (1839) with that of the present day, giving old and new field names. A section on National Change at Local level contained displays on population, education, the growth of democracy and the fight for a water supply. A Recent Events section ranged from Aldham's war effort through the jubilee celebrations to the ravages of Dutch Elm disease and the 1987 gale. In writing about the presentation afterwards Pam goes on to say that if Aldham had ever known wealth in its earlier days, it was most probably in the 15th and 16th centuries, when it may have shared in the prosperity of Hadleigh's flourishing woollen cloth industry. A Glebe Terrier of the 1680's lists a Teasle yard at the Rectory and the Tithe Schedule of 1859 no doubt echoes the past in listing a "Teasill Field". The Tithe schedule shows that 29 acres of land in Aldham were held by the Hadleigh Feoffees and Stephen Abbott, a yeoman of Aldham and juror at the Court of the Manor of Aldham Hall from 1691 to 1702, sold property in Benton Street in 1695. A document in the Hadleigh archives dated 1633 gives attorney from Robert Clifford, yeoman of Aldham, and his son Richard, to one Richard Wiles to grant freehold possession of a piece of meadowland to the Mayor and Aldermen of the town of Hadleigh. Just on 250 people visited the exhibition over the five day period it was open and all concerned will surely wish to say "well done Pam - you can do it all again next year!!" You may recall that Stretcher Bond is very common in its use; our next bond, Flemish, is equally easy to find. This is not surprising as it has been in continuous use for the last 350 years. 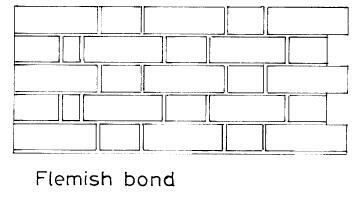 In Flemish Bond, stretchers and headers occur alternately in each course. See how on the next course, the header is positioned centrally over the stretcher. The lap of the bricks is a quarter, look for the Queen Closer at corners and against door and window frames which produce this lap. The bonds first use in this country was at the Dutch House, Kew in 1633, and by 1650 was in general use. Despite its name it is uncommon in Flemish countries, but its attractive appearance ensured that it was the bond to be used for all domestic building until the coming of the cavity wall ousted its use. Flemish Bond is still being used today, but mainly for boundary walls and the like. Now set out to find Flemish Bond. Benton Street is a happy hunting ground, as is the Market Place. Queen Street is exclusively Flemish Bond, while other major examples can be seen at East House, Toppesfield Hall, and much of High Street and Bridge Street. As you will see, Flemish Bond has been the most consistently used brick bond since the 17th century. COSFORD HUNDRED SAVING'S BANK is at Hadleigh. It was founded in 1818, and is open every Saturday, from 10 till 2 o'clock, at Messrs. Mills and Co's bank, in Queen Street. Mr. Grimwade is the actuary. On November 20th 1853, its deposits amounted to �,420, belonging to 659 depositors, 28 Charitable Societies, and 11 Friendly Societies. There are in the town two Friendly Societies, a Lodge of Freemasons, and another of Odd Fellows. The Charities of Hadleigh produce a yearly income of about �0, and comprise Almshouses for 36 poor people, and a Free School, now amalgamated with the National Schools, which are attended by about 120 boys and 200 girls and infants. Here is also a large British School, built in 1841, by J. Ansell, Esq., and divided into three apartments, for boys, girls, and infants, of whom about 160 are generally in attendance, but the rooms will accomodate 300. here is a LITERARY INSTITUTION, with a good library and reading room. This was carried out on Saturday 15th October (the planned day Sunday 9th being too wet). Most paths within 5 mile radius were covered by representatives of the Hadleigh Town Council, Ramblers Association, Naturalist Societies, Hadleigh Society (one? ); accompanied by interested members of the public. Footpaths marked on the Definitive map will be revised in the light of this walk; forms completed will be the basis for producing an up-to-date footpath map of the Hadleigh District and be used to provide a set of published walks for ramblers. After consultation with local landowners; "Way-Mark" signs will be erected where possible since many of the footpaths shown on the present Definitive map have been lost or vaguely defined. Mr Alec. O'Reilly, who is soon to leave Hadleigh has been the prime mover. Further volunteers are needed for this work. Anyone interested should contact John Holborn (Tel. Hadleigh 822539) or the above mentioned organisations. There are now two paths and both are in an unsatisfactory condition and the public has become confused regarding which route they should take. Iron poles scattered about and the whirring of an electrified fence have not helped. The County Council continue to be pressed to see that the original route remains the defined route and is made up in an acceptable condition for public use. At a recent meeting of the Environmental Group the Group Chairman reported on the meeting of members with Mr Stephen Brown and Mr Andrew Clark of Babergh District Council's planning Department to discuss the Society's representations on the Hadleigh District Plan for the 1990's. a) Many objectors have drawn attention to the absence of a Highway plan and a meeting is to be arranged with the County Highway's representative. b) It was felt that the recommendation that a site for a supermarket with car park beneath be included in the plan would not prove favourable. c) The points made about inadequate provision for community accommodation appear to have been understood. It is intended that the Society shall be represented at the Public Inquiry now expected to be held next March. Planning permission has been given for the proposed improvement and repair work on the Guildhall Complex. Details have been requested. The planning sub-committee continues to investigate planning applications and to comment on behalf of the Society where deemed appropiate. Recent objections have been made against the use of hanging signs in the Market Square and High Street and the plan to erect approximately 140 dwellings with associated roads and construction of vehicular access effectively linking the present Tayler Road with Edwin Panics Road with no link to Froghall Lane other than by footpaths. The next meeting of the group will be held on Wednesday 30th November at 122 Benton Street, Hadleigh commencing at 7.30 p.m. As ever any member of the Society will be most welcome to attend - just simply turn up and introduce yourself. The new managers of the pool have written to say that they are keen to play their part providing leisure facilities in the town and intend to introduce many new attractions soon such as Spa Bath and sauna. Further details may be obtained from Pauline Kennedy, the site manager, either at the pool or by telephoning Hadleigh 823470. The group continues to meet at regular intervals and recently made a most interesting visit to the County Record Office at Bury St. Edmunds If any Society member would care to join the group now is a most opportune time. The next group meeting will be held at 7 High Street, Hadleigh again on Wednesday 30th November from 7.30 p.m. (The clash of dates being quite unintentional and most rare ). We should be pleased to have your nominations for the above award. the closing date is 1st January 1989 but nominations in writing or by use of the special nomination form should be sent off without delay to the Secretary, The Hadleigh Society, c/o 106 High Street Hadleigh, Suffolk. The award will be an individual framed commendation in recognition of 'Outstanding improvements to, or conservation of, Hadleigh buildings or environment'. Subject : "Antique porcelain - its history and development"
A course for collectors, would be collectors or those just interested in the subject, illustrated by slides and more importantly by actual examples for examination. 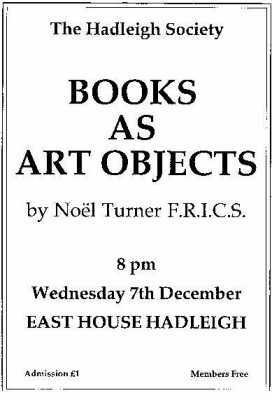 The next meeting of the Society will, of course, be on Wednesday 7th December from 8 p.m. at East House, George Street, Hadleigh when Noel Turner will be speaking on " Books as Art objects" (Sorry Noel, we nearly got it right in last month's newsletter - Ed.) All will be welcome (non-members at ) with refreshments and a chat to follow. So please do come along and join us. It would be helpful if you could arrange to display the attached poster. A programme of interesting speakers for 1989 has been drawn up and will be published as soon as we have confirmation of dates etc.